Those attending our upcoming Dancing with the Survivors galas this fall are in for a tasty treat. Thanks to Natalie’s Orchid Island Juices, a Florida-based, squeezed-fresh juice company, guests at our annual fundraiser can enjoy Natalie’s two ingredient, minimally processed, gourmet pasteurized Orange Beet juice in a signature cocktail they’ve developed specifically for the Dancing with the Survivors events. Why beet juice? Beet juice is extraordinarily rich in betacyanins, natural compounds that have been found to be powerful cancer-fighting agents. Beets also contain immune boosting phytochemicals called betalains which have outstanding anti-inflammatory, antioxidant, and detoxifying effects. Natalie’s is made from 100% pure beets and blended with Fresh Florida oranges to make a super nutritional juice. For a first look at this special Dancing with the Survivors drink recipe click here: Orange Beet Cocktail. Not only is Natalie’s providing the juice for our Dancing with the Survivors events, they’re also donating 40% of all Orange Beet Juice sales made in the month of October. 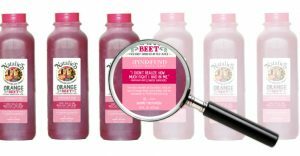 To top it off, the labels on Natalie’s Orange Beet Juice will feature information about The Pink Fund’s mission as well as inspirational quotes from our cancer survivors, all part of a campaign to raise awareness about The Pink Fund and the financial burden beating breast cancer creates for so many US households. Natalie’s founder and CEO, Marygrace Sexton, considers giving back to the community a driving component of the company’s overall mission. Coming from a modest background herself, she knows the challenges a family faces when trying to meet every day cost-of-living expenses. It’s one of the primary reasons Natalie’s partnered with The Pink Fund and is donating to our cause. Look for Natalie’s Orchid Island Orange Beet Juice at your local Publix or other grocery store and be sure to enjoy one of the Natalie’s signature cocktails at our Dancing with the Survivor galas this October.